Celebrity Cruises Hamilton Departure is back again! A 7 Night Eastern or Western Cruise and It's All Included! Your round trip non-stop airfare, your cruise, transfers airport to ship and ship to airport, a classic beverage package, gratuities and taxes all included for one price. Departures are every Saturday January 30 - April 03 2016.
non-alcoholic beverage package which can be upgraded to an alcohol package for a fee. Max. total baggage allowance of 20 kilos (44 lbs.) per person. 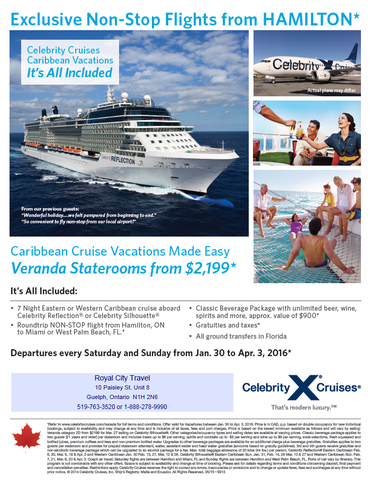 Celebrity Reflection® Eastern Caribbean Feb.
6, 20, Mar. 5, 19 & Apr. 2 and Western Caribbean Jan. 30 Feb. 13, 27, Mar. 12 & 26. Celebrity Silhouette® Eastern Caribbean Sun. Jan. 31, Feb. 14, 28 Mar. 13 & 27 and Western Caribbean Sun. Feb.